I’m feeling a little nostalgic today, the forecast predicts snow tonight into tomorrow and I’m giddy with excitement!! I never realized how much I missed snow until Charleston’s “snow storm” last winter. Last January (right after the New Year), Charleston, South Carolina (my home for the past 12 years) got a lot of snow…a lot of snow for the beautiful city that rarely sees snow. Snow falls in Charleston maybe every 5-10 years. And this snow was different than a small flurry of snow flakes that within hours melts away from the sun. We got snow! Lots of snow…all day and all night! At that moment when the sky was gray and everything around us was covered in a blanket of fresh fluffy powder, I remembered how much I loved and missed snow. And seeing my four year old son’s eyes light up as he ran outside to play, was icing on the snow sprinkled cake…and in that moment it solidified my hopes of moving back home to Maine! We were not equipped at all for snowfall, hence my son’s rain boots and blue khaki pants (don’t worry, he did have footie pajamas underneath for an extra layer). His jacket, hat and mittens however were purchased only weeks before for our visit to see grandma over Christmas. This bulldozer was a Christmas gift and was the perfect snow scooper. These two (my son and the best neighbor friend we could ask for) had the whole street to themselves, with not a sole in site. It was pretty magical to witness and capture. Her tongue out…is there anything more fun than eating snow as a kid? Photographing in the snow was a first for me and is probably my favorite thus far. It was pure magic and I couldn’t get enough of these two together and the beauty around us. Everything was so quiet and peaceful around us, just the sound of their laughter and excitement. Buddy, our neighbor dog, had to see what the big fuss was all about. Umm, how practical is a scooter in the snow! Our puppy Myrtle (who isn’t much of a puppy anymore), came out too. She however, unlike my boys, had seen and played in fresh snow as a puppy back home in New England…almost 12 years ago. 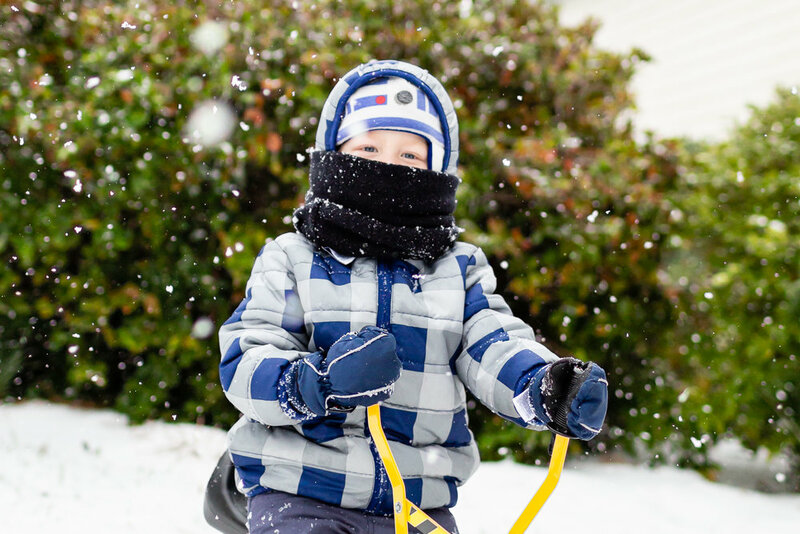 Stay tuned for part two…it’s filled with tractor rides through streets lined in snow-covered Palmetto trees (aka palm trees), my youngest son’s first time seeing snow and the neighborhood kids “sledding” on every item you can think of (hint…laundry baskets, pizza boxes and even a baby pool)!